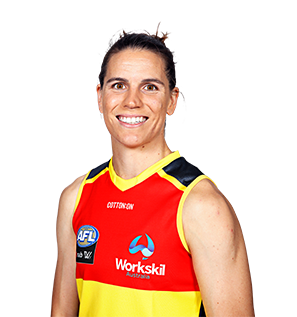 A star of the competition, Randall guided the Crows to the inaugural AFLW premiership and earned All-Australian selection. 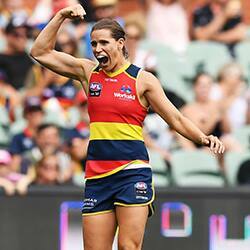 Also finished runner-up to her club co-captain Erin Phillips in the Crows’ best and fairest. The versatile West Australian can dominate in the midfield, but also did key defensive roles across centre half-back. Quick, agile and has an excellent vertical leap, which allows her to play on taller opponents. Player honours: Crows Club Champion 2018; All Australian captain 2018; 2nd best and fairest 2017; All-Australian 2017; premiership 2017; co-captain 2017, 2018. Draft history: 2016 marquee signing (Adelaide). 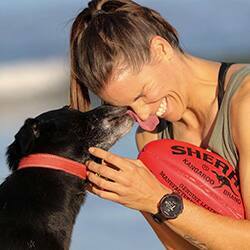 Lived up to her status as a marquee signing, guiding the Crows to the inaugural AFLW premiership and earning All Australian selection. The fearless utility, who often played a selfless role in defence, was recognised by her peers at club and League level. Won the Crows Players’ Player and AFL Players’ Association Most Courageous Player awards. Stood up in games and at pivotal moments, finishing second to fellow co-captain Erin Phillips in the Grand Final best-on-ground voting. Also came runner-up to Phillips in the Crows Club Champion award.